If you loved my Baked Buffalo Chicken Dip, then you’re really going to love this equally delicious, equally cheesy, Slow Cooker Buffalo Chicken Dip Recipe! Made with juicy shredded chicken, creamy ranch dressing, hot sauce, and loads of cheese, enjoy this easily transportable Buffalo Chicken Dip at your next potluck or party! Hands down, Buffalo Dip is the best party food that ever existed. Filled with simple ingredients like shredded chicken, shredded cheese, cream cheese, hot sauce, and ranch dressing, this Slow Cooker Buffalo Chicken Dip is basically cheese covered hot wings dipped in ranch dressing. I don’t know about you guys, but I’m ready to throw a party just thinking about it. The best part about Buffalo Chicken Dip? It couldn’t be any easier to make! Especially this crock pot version which requires some simple dumping, stirring, and patient waiting. And, if you’re lucky enough to snag some leftovers, this Buffalo Chicken Dip loves being wrapped in soft tortillas or scrambled in eggs for an extra special lunch or dinner. As in my other Buffalo Chicken Dip Recipe, I wanted to stay away from any kind of Dry Ranch Dressing Mix and use the real deal instead. Fortunately, I’ve been making this homemade ranch dressing nonstop lately so the swap was no problem. If you don’t have any homemade on hand, no worries! Use your favorite store-bought variety in its place. What is the best way to cook chicken that will be shredded? This is actually a really excellent question with more than one answer. Some people like to cook theirs in the instant pot, while others prefer to cook their chicken in the slow cooker. 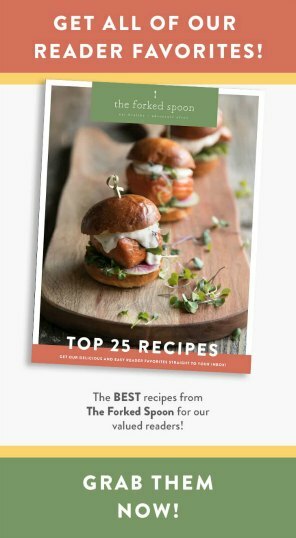 For me personally, I will almost always poach my chicken breasts and then shred them. How to poach chicken. Bring a large pot of water to a boil over high heat. Once boiling, carefully transfer the chicken breasts to the pot, making sure that they are all fully submerged with water. Return the water to a boil, cover with a tight-fitting lid, and remove from heat. Allow chicken to poach in the water for 25-30 minutes, or until internal temperature of the chicken reaches 165 degrees F. Remove from pot and allow to rest until cool enough to handle. Once the chicken has been cooked and shredded- which can easily be done ahead of time if you know you’ll be running short on time– it’s time to start dumping. 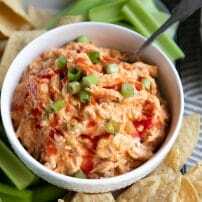 As with many slow cooker recipes, this crock pot Buffalo Chicken Dip is all about adding the ingredients, stirring it all together, and letting it do its thing. And, after about 1-2 hours you’ll have hot, bubbly, cheesy, buffalo sauce goodness! 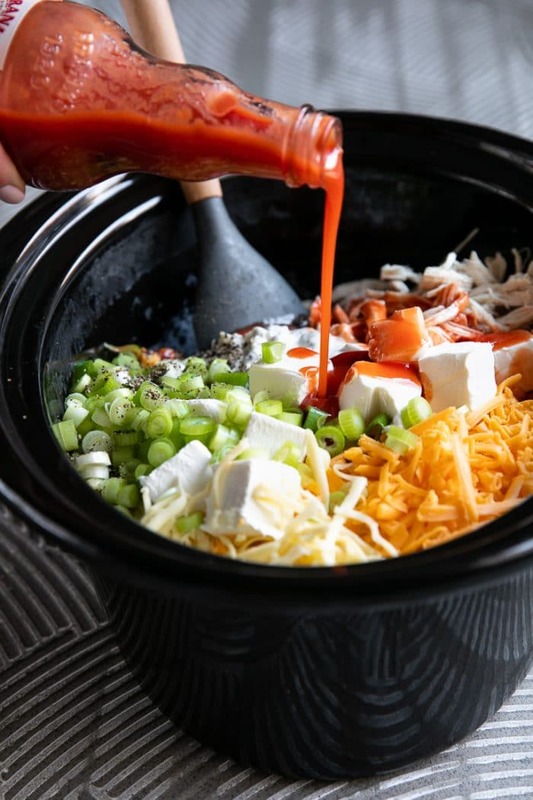 What is the best hot sauce for Slow Cooker Buffalo Chicken Dip? Frank’s RedHot Sauce, hands down. 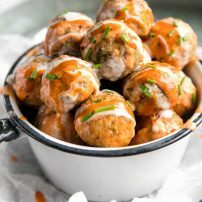 Used in all my buffalo sauce recipes, including this Easy Buffalo Cauliflower and Buffalo Turkey Meatballs, Frank’s RedHot is easy to find in most supermarkets or on Amazon. 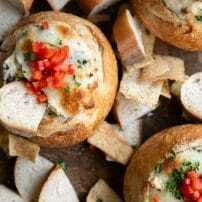 Affordable, flavorful, and just the right amount of spicy, it tastes great plain or mixed with cheese, protein, or vegetables. 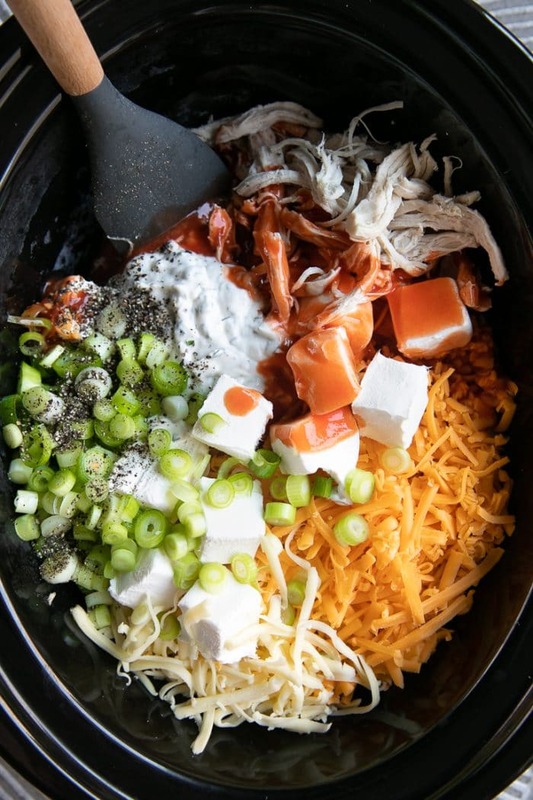 Is this Slow Cooker Buffalo Chicken Dip Keto-Friendly? Yes! Good news to all my Keto friends out there! Packed full of poached shredded chicken breasts, mixed cheese, cream cheese, ranch dressing, and hot sauce, this recipe is low carb and keto approved. 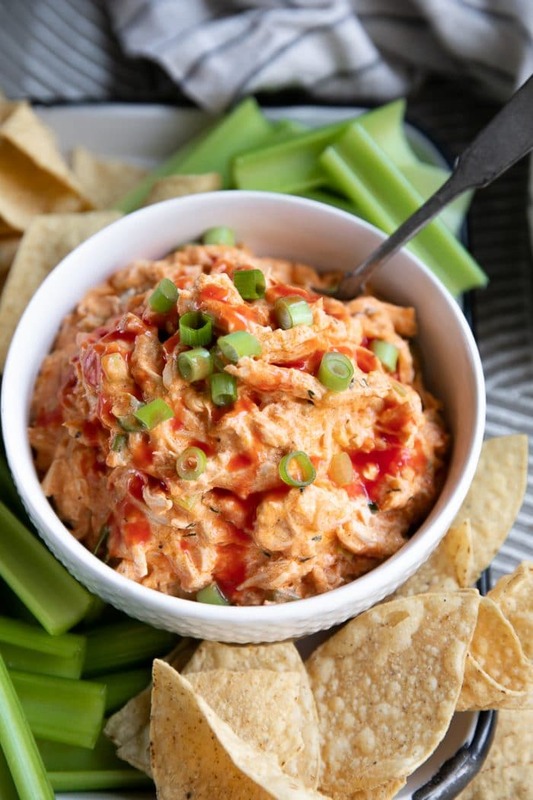 What can you serve with Buffalo Chicken Dip to keep it low carb and Keto-friendly? Thanks to the explosion of low carb brands and products available these days, supermarket shelves now come stocked with low carb crackers and chips. You may also serve with celery sticks or other low carb vegetables. Grate your own cheese. This is a somewhat minor tip, but freshly shredded cheese always comes together better when compared to pre-shredded cheese. My guess is that it has something to do with the anti-caking agent that is added to cheese when it is packaged, but in any case, it is one extra (super simple) step that I have found myself doing more and more lately. Unless you’re planning to serve this dip to a team of high school football players (translation- it will be gone in 2 seconds flat), I recommend keeping it inside the slow cooker on warm setting at serving. This will help prevent the cheese from hardening. The ranch dressing. 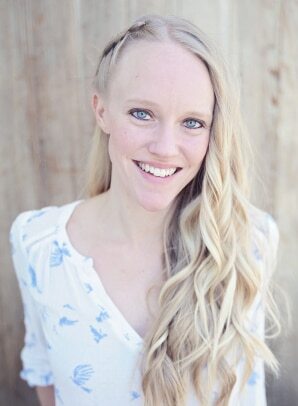 Just because I love ranch dressing, doesn’t mean you love it, too. If you’re team blue cheese, feel free to swap the ranch for blue cheese. Or, go in half and half. OR, top your Buffalo Chicken Dip with big chunks of crumbled blue cheese. Or, leave it out and add extra cream cheese. You do not have to use Frank’s RedHot. It’s simply my personal favorite. The chicken. 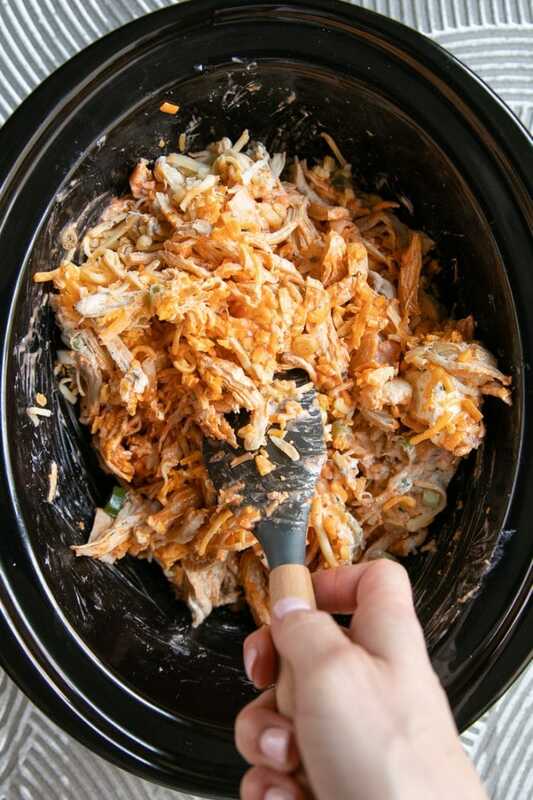 Shredded rotisserie chicken, or even canned chicken, make great substitutes for poached shredded chicken. If you do use canned chicken, take extra care when mixing as the chicken is crumbly and will break apart. To help make it easier to stir everything together, bring the cream cheese to room temperature first. 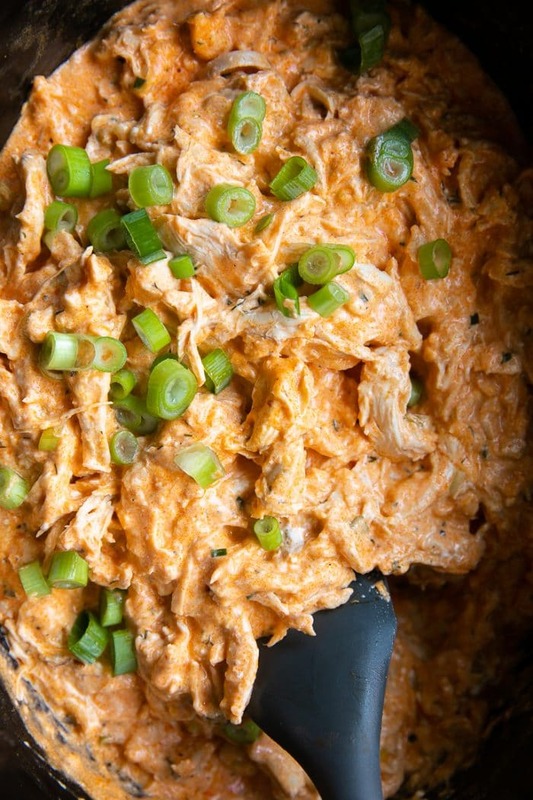 Can you prepare this Slow Cooker Buffalo Chicken Dip Ahead of time? Depending on how much time you have, you may either prepare just parts of this recipe ahead of time or the whole thing and store in the refrigerator until you are ready to start the slow cooker and serve. The easiest way to save time when making this baked buffalo chicken dip is to cook the chicken ahead of time. Poaching and shredding chicken takes approximately 40 minutes, start to finish, so if you can knock that out and have the chicken ready, you’re already way ahead of the game. 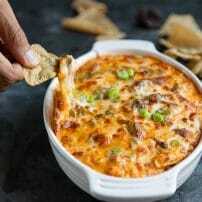 You can also prepare the entire buffalo chicken dip recipe. To do this, mix the chicken with the remaining ingredients and transfer to a large bowl or storage container with a tight-fitting lid. Store in the refrigerator for up to 24-48 hours before transferring to the slow cooker to cook. 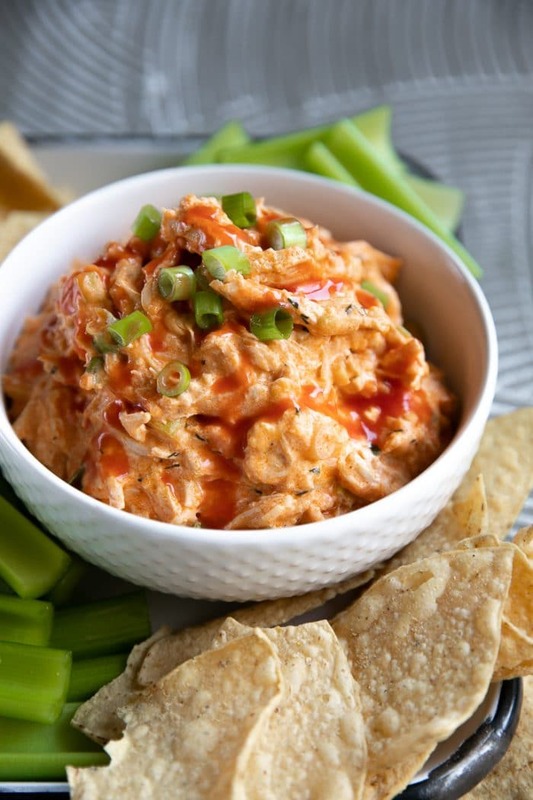 Can you freeze leftover Crock Pot Buffalo Chicken Dip? I do not recommend freezing leftover buffalo chicken dip. Reheated from frozen and the cheese mixture becomes somewhat chalky, lacking that luxurious, creamy texture we love so much. Topped on a frozen pizza. 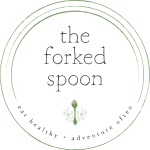 Or, simply eaten by the spoonful. If you try making this Slow Cooker Buffalo Chicken Dip Recipe, please leave me a comment and let me know! I always love to read your thoughts and feedback! DON’T FORGET TO PIN AND SHARE THIS EASY CROCK POT BUFFALO CHICKEN DIP RECIPE AND MAKE IT FOR YOUR NEXT BIG PARTY! Made with juicy shredded chicken, creamy ranch dressing, hot sauce, and loads of cheese, enjoy this easily transportable Buffalo Chicken Dip at your next potluck or party! Prepare the chicken. Bring a large pot of water to a boil over high heat. Carefully add the chicken breasts to the pot, making sure they are fully submerged with water. Return to a boil and cover pot with a tight-fitting lid. Remove from heat and allow the chicken to poach for approximately 30 minutes, or until fully cooked. Remove from the pot and set aside until cool enough to shred. As the chicken cooks, prepare the remaining ingredients. Shred or chop the chicken into small bite-sized cubes and transfer to the bowl of a 4 quart or larger slow cooker. Mix in the remaining ingredients (cream cheese, ranch dressing, hot sauce, black pepper, garlic powder, onion powder, green onion, cheeses). Cover and cook on LOW for 2-3 hours or on HIGH for 1-2 hours, until hot and bubbly. Sprinkle with fresh chopped green onion, hot sauce, and additional shredded cheese, if desired. Serve hot with tortilla chips, veggie sticks, or leftover in wraps the next day!